It's the day every Apple fan-boy has been waiting for (since the new iPad that is): the official invite to the new iPhone launch event on September 12 has finally gone out. And what's that in the shadow of the calendar date? 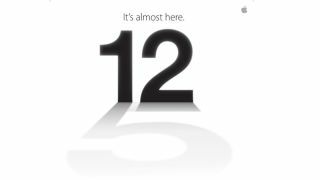 It's only a big old 5 - does this mean that the iPhone 5 will officially be called the iPhone 5? After months and months or rumours, speculation and leaked parts, we will learn what the Cupertinio-based firm has up its sleeve for the sixth incarnation of its popular iPhone series next week. Commonly referred to as the iPhone 5 on the web, until this invite, our money was on the moniker "new iPhone" to coincide with the recent change of tack with the iPad, which follows on from the MacBook and iMac ranges. Obviously Apple is keeping as tight lipped as ever over the new iPhone; however thanks to the sheer volume on internet chatter and specification leaks, we're pretty sure that the sixth iPhone will sport a design first for the firm, a bigger screen. Numerous rumours suggest the iPhone 5 will sport a 4-inch display - up from the 3.5-inch screen on its predecessors - offering a movie friendly, 16:9 aspect ratio, along with a beefier, possibly quad-core processor, improved cameras, smaller dock connector, NFC technology and a new, slender frame featuring both glass and metal accents.